There are many steps to the process of building a home. It is crucial that the first step towards integrating your home with tomorrow's technology is a properly designed wiring infrastructure or structured wiring system. We understand the importance of designing home systems for the lifestyles of today and preparing them for the lifestyles of tomorrow. A structured wiring system is more than just a random set of cables run throughout the house, but rather is a systematically designed wiring scheme which is installed by very stringent guidelines set forth by an alliance consisting of the national electric code, consumer electronics association, national home builders association, society of television systems engineers and the data network alliance. 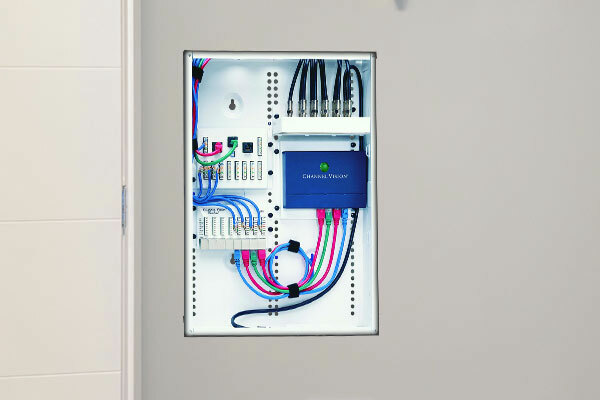 Our structured wiring packages are designed to bring together each subsystem into one fully integrated system — while accommodating upgrades. Our structured wiring packages address audio, video, surveillance, phone, TV, Internet, Ethernet, wireless beacons, cellular phone amplification and more. Not one firm in North Central Florida can offer you the most comprehensive code compliant structured wiring system as Electronics World.